From his birth in the hideous underground city of Menzoberranzan, where murder and treachery are common coin, to the high passes of Icewind Dale in the surface world, Drizzt confronts enemies at every turn. 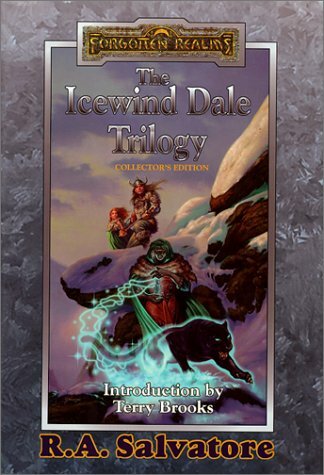 Yet in Icewind Dale he also finds the friends who will support him in his adventures and will offer him that which he most desires: friendship and love. We all owe a debt to Akar Kessel, that treacherous chump of a wizard's apprentice, briefly known as the (short-lived) Tyrant of Icewind Dale. Akar started it all when he stumbled across the ancient and malevolent Crenshinibon, the Crystal Shard, thereby kicking off one of fantasy's best and best-loved series--and at its heart, one of the genre's most beloved heroes, the noble dark-elf ranger Drizzt Do'Urden. While surely no Tolkien (who is, really? ), Bob Salvatore can take pride in the fact that he's brought legions of enthusiastic fans to the genre--and for anyone who's caught themselves in an embarrassed yawn on page 412 of The Silmarillion, that's not a distinction to be taken lightly. You'd have to be a pretty cold fish for your pulse not to quicken a bit as Drizzt and company lay into yet another ravenous horde of trolls (or giants, or wererats). As an affectionate Terry Brooks says in his introduction to this collector's edition, you could do worse than to have your tombstone say you were a solid, workmanlike writer. And Salvatore, through his superior characterizations and knack for just telling a believable, engaging, and lovable story, transcends even that worthy praise.